» Join us this year as an Associate Member at half off the Normal Price! Join us this year as an Associate Member at half off the Normal Price! Due to the success of our online newsletter and in celebration of the great support we have received from all over, I am inviting you to become an associate member of the New 49’ers at half the normal price. 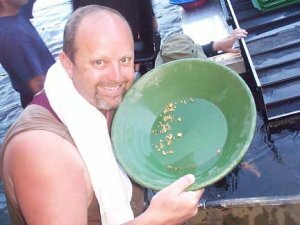 I would really like you to come out to Happy Camp and join us for some true life gold mining adventure. 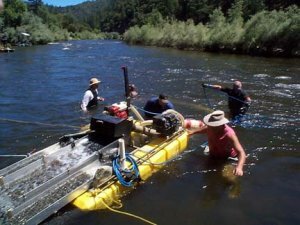 We have a special program for persons who are interested in being involved with our organization, but only want to spend about a week each year actively participating along the mining properties made available by the New 49’ers in Northern California. As an Associate Member, you will receive the regular newsletters and will be kept up to date on news, along with other important information affecting our industry. Associate members may choose one week of your choice to enjoy all of the benefits of active New 49’er membership each summer (between 1 May and 30 September) along the Club’s available mining properties. You are also invited to attend any or all of the Club’s scheduled weekend group prospecting projects. at no charge. Associate members are allowed to bring a spouse and children under the age of eighteen, and you also receive the discounted rate on week-long group mining projects (as Full Members do). We will also send you at no additional cost the New 49’er DVD. This is a brand new 30-minute DVD which captures the fun, excitement and winning spirit which our members have been experiencing during the past few years along our mining properties. There is a lot of really good stuff happening on our properties these days! New 49’er members, Haze & Andy Williams and I devoted countless hours filming and editing to create a fully-updated Club video. It is finished, and now ready to send out in DVD format. This is the DVD you want to show your friends and family when they want to know why you are passionate about gold prospecting!